This demo will cover a lot more than just sharpening tools! Certainly the presentation will include the turning tools most commonly used and how they are sharpened. However, it is helpful to understand both the advantages and the limitations of a given tool geometry. For example, there are limits to the shape of bowl that can be turned with a bowl gouge that has a 40 bevel angle. The geometry of certain tool shapes will be discussed using diagrams and tool models that Paul has prepared. 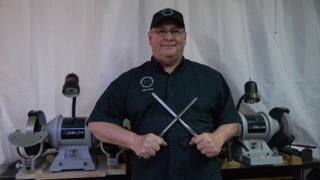 The Oneway Wolverine sharpening system will be used in the demo and Paul will discuss a few other sharpening aids that he has used. The demo will also cover the use and sharpening of some turning tools that are not commonly used such as the Bedan, Captive Ring Tool and the Spindlemaster. If time allows, Paul will turn with some of the tools and end the demo with a turning project. Paul Tiefel has worked with wood since he was a boy helping in his Dad’s workshop. His first successful projects were the treehouses Paul and his brother built in the large Hickory Nut Trees on their property. He first exposure to woodturning was in Junior High School shop class. Paul received a B.S. degree in Petroleum Engineering in 1973 and began working in the oil and gas exploration business. In 2001, Paul moved to North Texas and semi-retired. Soon thereafter he started woodturning in earnest and joined the Woodturners of North Texas in 2002.